This is an often asked question and one that has a multitude of answers depending upon the motivation of the person answering the question. Sometimes the most popular tool is not always the best because ‘popularity’ of something is not always the same as being ‘the best’. In addition the question must be tempered with “best for what? One of the most popular keyword tools is Google’s Keyword tool now called Google Keyword Planner and as it’s free and made by Google, it makes sense that many people use it. Although it is a hassle for new users to set up since it requires having an AdWords account. However if you do a Google search on popular keyword tools you will get a list of other names like, MOZ, SEMRush, Wordtracker, Ubersuggest, SEO Book, Keyword Discovery, SpyFu, and others. But you get the idea, there are plenty of “popular” keyword tools. But the question remains what is the best? Now I haven’t personally used all the keyword research tools listed above, other than Google Keyword Planner (but I have researched them all). So I can’t claim to be an expert at which is the best. However I can claim to use a particular tool (not listed above) that I think is the best because it get’s me page one rankings. Take a look at these recent screen shots. Knowing the words your target audience searches for online is important and all keyword research tools can find these words and often other frequently used keywords in your niche or industry that you may not even have thought of. Most keyword tools give you the search volumes, pretty graphs, charts, and lots of interesting numbers, in fact so much other data that more often than not the amount of information often tends to overwhelm most people. In fact most keywords tool give you way-too-much information that you don’t really need and is actually irrelevant to getting you a page one ranking. 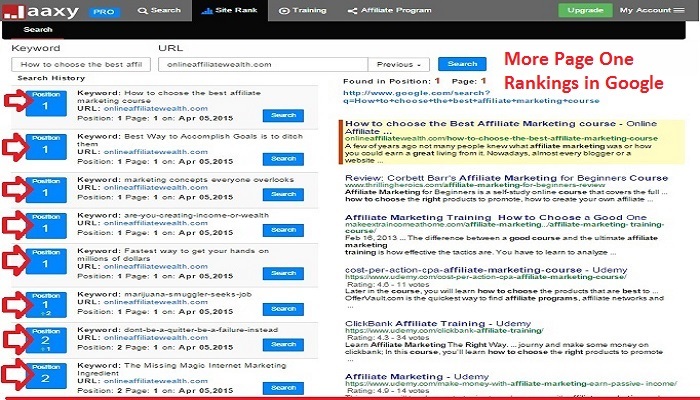 The keyword research tool I used allowed me to select low competition keywords that have high traffic and I was able to write content using those specified keywords and get ranked on page one within a few hours. Not all the key words I selected necessarily had high traffic but they were words that I could get a page one ranking for. And if you are thinking this is was just a ‘lucky break’ Here is another screen shot that shows more of my pages, for this particular website, that have page one Google rankings. So what’s the special Keyword research tool that makes ranking so much easier. It’s probably one you may not have heard of because those that have it, probably like to keep it quite, because it’s so powerful. It’s called Jaxxy and you can read more in my review on it here. To often people waste their time, trying to get their website to rank on a page in Google where it can get traffic after they have it posted online. There is little point in trying to optimize your website content for words or phrases that will not generate traffic because there is too much competition for the particular word or words they are using . Yet this is what many people attempt to do and they struggle to get rankings in Google. Having a keyword search tool to do competition analysis in a simple and easy to understand manner is important if you want to get a good ranking in Google. Why is this type of Keyword research so important Because you want don’t leave behind valuable low competition words that your target audience is hungry for. It’s a bit like fishing. The fish are actually attracted to your bait, not your boat. It’s not about knowing where the fish are, or how many of them are under the water. Rather it’s about knowing what type of bait the fish are looking for and ‘eating‘ and this means you stand a better chance of catching a fish. All to often people like to build their own bait and throw it into the water and hope to attract fish. Keyword research allows you to ‘look beneath the water‘ to see what the fish are already being attracted to.This is called organic keyword research. Finding the words that people are already searching for is a great way to understand the type of bait you need to start catching your fish. Having the right tool for the job is going to make getting good rankings easier and your business more profitable. Doing keyword research to find the best words is the best and most profitable thing you can do. Finding the best Keyword tool would also be very extremely helpful if you want to get on page one. Read the review of this keyword research tool and see how it will work for you. Wow, you have done amazingly well with your page rankings. Do you put this all down to the tool you suggest. I do always hear people talking about the google keyword tool but it is missing some key aspects, I know what you mean. I am seriously impressed with your rankings. How long have you been working on your website? Is this a factor of your ability to rank so well? Useful post, I had a free account with Jaaxy that I signed up for a few months ago.I really liked it, at the moment I haven’t needed anything as in depth so I’ve stuck with some of the free keyword tools you mentioned. I know with the free version a lot of the features aren’t available, what are the key functions you get over the free version when you pay for Jaaxy? Finding the right key words is definitely an important yet tricky process, especially for me. Thank you so much for all the tips and advice. This was exceedingly well done. I’m glad I came across this, for you discussed everything I could possibly need to know. Also, your site looks very nice and wholesome. Certainly going to have to bookmark this. I never knew Jaaxy existed before I have went through this article. I then used Jaaxy to see with what it came up and I was surprised. So many people do not look at the amount of competition for a specific keyword and this is very important data. I know that it is also important to know about the quality of competition, but there is also a high correlation between the quality and the quantity. Keyword research is probably the most important thing to get right in this business. Without the proper tool to get you the right information you are never going to get your posts to rank well. I have used Jaaxy for months now and will always have it in my online business arsenal. Great information about your success with this great Jaaxy tool. Peter how would you think the role of keyword research in Google rankings. There are so many Keyword tools out there and some are free so how would you stand tall Jaaxy among others. Thanks again for providing great information. Those are some impressive search results! Keyword research are two words that used to make me cringe! It’s something I’m honestly just getting the hang of. 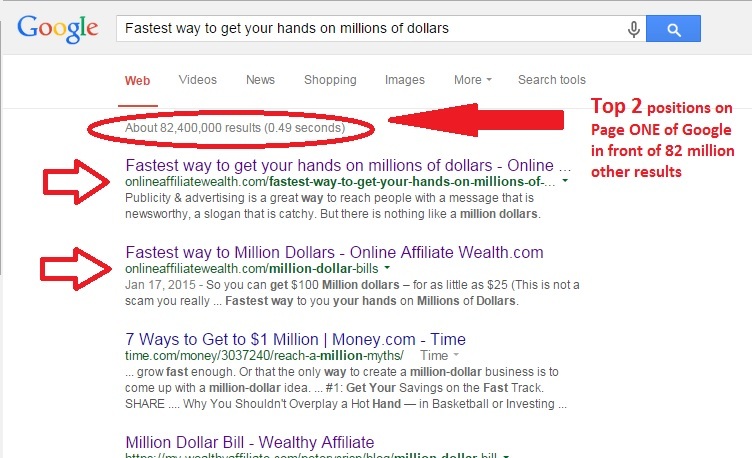 I’ve been using a tool on Wealthy Affiliate to do my keyword research but I think I might give jaaxy a try. Your review makes the investment seem worth it… Being on page 1 of google is $$! This is a good article. I have found that all most of those keyword tools you mentioned as being popular steal the stats of Google. Maybe steal is too strong of a word, but they depend on Google to deliver the results. None of them seem to be very accurate and they do not offer much extra that would make you want to pay for the services. Yet, so many people pay the unnecessary subscriptions anyways. I have a Jaaxy account and I like it a lot, especially the power it has to get articles ranked so well. Hands down, I rest my case Jaaxy is the best. However, while you might have trouble getting new Blog Post Article Ideas to write about, I suppose the best one you can consider helping you with that would be Ubersuggest. Oh I did not realize there was such a thing as Google Keyword Planner until I read about it here mentioned in your Blog Post Article Peter. Great post on Keyword Research. It’s an extremely important part of content marketing and is going to lead to much better rankings and traffic to your site. I’ve never heard of Jaxxy and usually just use the Google Keyword Planner. I see that you’re getting some great rankings using the tool. Are there any fees associated with Jaxxy? Also does it have any features that let you look at past searches that you’ve made. I like to be able go back and check results again. Hi Brok. To answer your questions, yes on both counts although you can use Jaxxy free with their trial version to make sure it’s what you want. Give it a try I’m sure you will love it. I was a free member of Jaaxy for a while. I am very new to online business and did not quite understand the importance of keywords until recent. Now I have upgraded to a paid member and began realizing how valuable the information Jaaxy provides is. I could quickly come up with several keywords that I can write articles about. I am especially impressed how easy it is to use Jaaxy. I have not tried any other keyword tools, but I feel I don’t need to. What an awesome article about keyword search and the best use of it, as well using the best tool for it called Jaxxy. I have used jaxxy in the past and I have to admit I really loved it. I also tried using other keyword search tools and got actually more confused than enlightened by it, if I may say so. I guess everyone has to do some experimental work first before admitting to the right help. Hi Peter! This is a really good article and I couldn’t agree with you more about Jaaxy! In my experience, for the price, there isn’t another keyword tool that compares. I really like using Jaaxy for checking my website rankings. Since it keeps a history of previous searches, I can go through my keyword list in no time. I have wondered what the best keyword tool is for quite sometime. I have personally used Jaaxy with good success. Clearly it is very important to research keywords for poplar searches and low competition. I love that Jaxxy has the SEO score to help decide the value of your keywords. I just wanted to pop back here and thank you for the top recommendation you’ve given me with Jaaxy! I signed up for the free version and quickly upgraded when I saw how effective the competition parameters were – what an excellent tool!!!! Impressive results, I have tried Google keyword planner and it is basically for adwords campaigns and only gives you one useful metric, monthly traffic. I have not tried the other keyword tools but I do use Jaaxy and it is awesome. It gives you the data you need plus a lot of other useful tools. By the way I loved your fishing example. That is a perfect analogy. Many thanks for such a thorough introduction into keyword search and for presenting Jaaxy as the best keyword tool. From your own successes in Google ranking, it is obvious that it served you well. I used Jaaxy only for a short period, for 30 free searches and I can say I was delighted with it, so I can only confirm what you are saying. But unfortunately I cannot afford it as a premium member. Presently I am using Keyword Tool and Wealthy Affiliate. How would you compare it with Jaxxy? I’m glad I stumbled across this article – I have a question regarding keyword research that has been bothering me for quite some time now. I currently use the google keyword software ( as it’s free! ) but I find that the competition factor is always off with it. What tool would you recommend for zeroing down on this competition side of things? If you ask any website owner what their major headache is? He or she will tell you that it is how to get his or her website rank on page 1 of Google where it can generate traffic once an article is posted online. The very first beginning of getting ranked is what you have discussed in this your post. Once you get this right every other thing will fall in place. Jaaxy is a great tool for this purpose. Thank you for this beautiful write-up. I have tried Jaaxy and really enjoyed using it, eventually I want to sign up for an account. Have you tried Long Tail Pro? I see it promoted all over the place! I had never even heard of Jaaxy until recently. I tried Long Tail Pro and I found it useful, but I like the interface of Jaaxy so much better. Jaaxy is incredible. I’ve been able to find a lot of keywords that I will be using in the future that have very good potential to rank. It’s the most in depth and valuable keyword tool that I have come across and I’ve learned a lot through using it. The fact that you have so much success to prove through Jaaxy shows how great it is and how well it works. It really is a goldmine for marketers and those looking to get their content out in front of real people. I enjoyed your great detailed article about keyword tools. I totally agree with you that beside the fact that some tools are more popular, there are other tools with more usage and better functionalities. Jaxxy is my favourite keyword tool too. It has a great user interface and it simply works! These are what a good product needs. Google’s keyword tool actually puts me in shock and awe every time I think about how they don’t share all of the most important metrics when it comes to keywords and seeing if you’ll be able to rank for them. Why wouldn’t they share that information? Oh well, we got Jaaxy 🙂 Cheers! I’m still new to this game and have done some of the free searches with Jaxxy, but I haven’t made a formal commitment. I know one school of thought is that you spend money to earn money… and to an extent, that is always true. I’d just like to start earning something before I jump in with too many monthly commitments. I’ve used dmoz, and that is actually a pretty cool tool. Ultimately, I suppose it depends on the time and energy we spend on the key word searches. I am learning. Thanks for sharing your secret to get page one results! 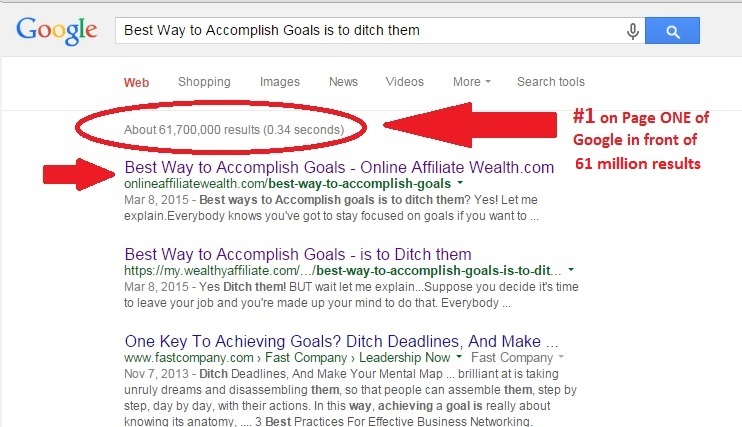 Wow, it is amazing that you are getting a lot of no.1 rank in the Google Search page one! You are pretty much like an SEO expert already. If I may ask, do you just use Google Keyword Planner and Jaaxy separately or do you use a combination both keyword tools? Aaahh…. now I see. No wonder you have tremendous success in your rankings! I really appreciate that you take the time to answer my question. I learned something really important today from your article and comment. Thanks again Peter! Your article is well written and it shows proof just how powerful JAAXY is when it is learned and used properly. I myself do not use JAAXY, I prefer the content driven method of gaining traffic. While I will agree with you, keywords are important, Content will always be king with me. If I do decide to go with a Keyword tool it will be JAAXY, I have used it in the past and it does great, especially the Enterprise level. Hi, you are really spot on with how things have gone bad because politicians and the high and mighty have turned things upside down. By making the system to be top to down instead of down to up. Which I think, as you rightly stated is responsible for the collapse of stock market and the rest. But I am happy that some measures are being taking to reverse the trend. Thank you for this wonderful post. Results, in the form of your keyword tool leading to page one rankings, to me is the best indicator of a great keyword tool. Love the fish analogy, really brought the idea home for me. I’m really looking forward to trying out Jaaxy in the near future, thank you for the recommendation.